We Have Always Lived in the Castle [Book Review] – my books. my life. I got a little behind on my reviews, so here is the first in a series of mini-reviews because I waited just a little too long to do a full review justice. 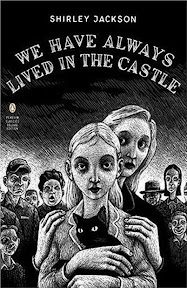 We Have Always Lived in the Castle is the story of Mary Katherine (“Merricat”) who lives with her sister Constance and her uncle Julian in their enormous and isolated house. The three are almost completely cut off from society and live by their own daily routines. Actually, the story is about what happens when their simple lives are disrupted and these routines fall apart. I adored this book. But I am going to have a very hard time explaining why. It was amazingly creepy and entirely engrossing. It was interesting to watch the RBC discussion unfold and the different theories everyone came up with along the way. Shirley Jackson deserves all the praise she gets for this novel and everyone should read this. Soon. I probably already posted this somewhere, but I love Shirley Jackson. If you liked WHALitC, you should read “The Haunting of Hill House.” It is terrifying and an amazing character puzzle. I also loved this book and plan to re-read again for Carl’s RIP challenge this fall. This is such a weird and creepy book. Also it’s rare at RBC discussions that everyone really likes the selection, which was the case with this one. Usually at least one person doesn’t like it or is meh about it. I’ve got The Haunting of Hill House as well so I’m looking forward to reading that. I LOVED this book too! But yes, explaining what’s so great about it is hard, especially without spoilers. Pingback: I Joined a Book Club and Actually Read the Books! | my books. my life.